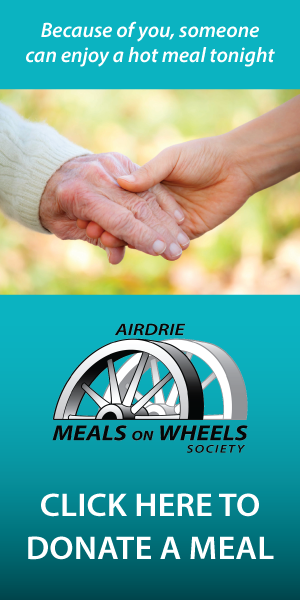 How does Airdrie Meals On Wheels utilize volunteers? Airdrie Meals On Wheels is operated entirely by volunteers. Volunteers are needed to deliver meals within Airdrie on weekdays from 10am to 12:30pm (no weekends or holidays). Volunteers are also needed to serve on the Board of Directors. What qualifications do Airdrie Meals On Wheels volunteers need? Have an interest in assisting seniors, persons with disabilities and persons recovering from illness or injury to remain in their own homes. Access to a vehicle and valid insurance. Must complete a Police security check (paid for by Volunteer Alberta through Airdrie Meals On Wheels). How often do volunteer drivers deliver meals? Drivers volunteer based on their availability each month. What volunteer orientation is provided? Each prospective volunteer completes an application form, an interview with the Volunteer Coordinator, and a Police security check. Each new volunteer accompanies an experienced volunteer driver on 2 delivery days. A volunteer handbook is provided to each new volunteer. What is a typical day for a volunteer driver? Meals are picked up from the kitchen at 10:30am. Meals are delivered to client homes (between 6 and 10 deliveries). Empty meal bags are returned to the kitchen and the volunteer records the km driven and hours spent delivering. How do I enroll a new client?